Built in 1870 by Eastwood & Tolson to a Renaissance design by Wakefield architect William Watson, the Wakefield & Barnsley Union Bank is now Barclays Bank. Watson insisted that "all timber to be of the best red Baltic produce and should be clear of sap, shakes, large or loose knots, wavy edges or other defects." Elland sandstone was used for the walls with a roof of Bangor countess slate. Some of the carved heads on the keystones appear to be portraits of the masons who built the bank. A fine building. 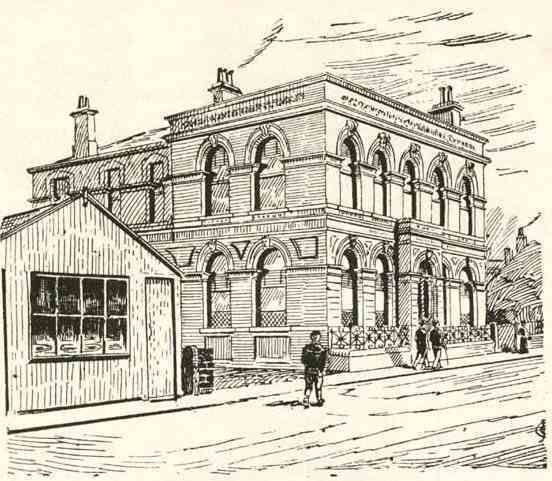 The wooden hut next door to the bank on this sketch from "Cockburn's Ossett" used to be a tobacconists and sweet shop then later a tripe shop owned by "Olly" Oakes.